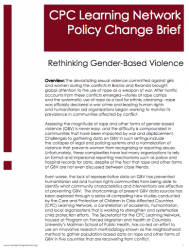 The CPC Learning Network has developed policy briefs addressing the importance of re-thinking approaches to gender-based violence programming to provide guidance for practitioners and policymakers that is accessible, practical, and action-oriented. This policy change brief details the Neighborhood Method and its past uses by the CPC Learning Network. Based upon the finding that key informants have been shown to provide information that is at least as valid and reliable as that obtained through self-report, in certain studies of sensitive public health behaviors, the neighborhood method was designed to complete a camp- or district-wide assessment in about three weeks.